Sustainability and social responsibility are important elements in any society – and are increasingly becoming issues in corporate governance too. Energy shortages, scarcity of resources, climate change and increased pressure of competition nowadays directly impact on a company’s business activities and future perspectives. 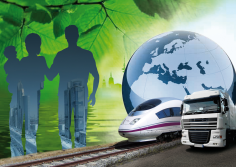 Knorr-Bremse’s response has been to face up to its corporate responsibilities and integrate the concept of sustainability into its business strategy. On the Knorr-Bremse Group pages you will find more information to illustrate our ongoing commitment.